Go to www.wow-heroes.com and on the character tab fill in the information for your zone, realm and character name. Be sure to click the box next to "live" and hit the search button. Your character screen will pop-up with a lot of information about your toon. This will show what raid zones you are suitable for given your current gear set. It shows your raid completion and lists the world of log reports that were taken from groups you've run in. This will also show your current gear and which items are missing gems/enchants. 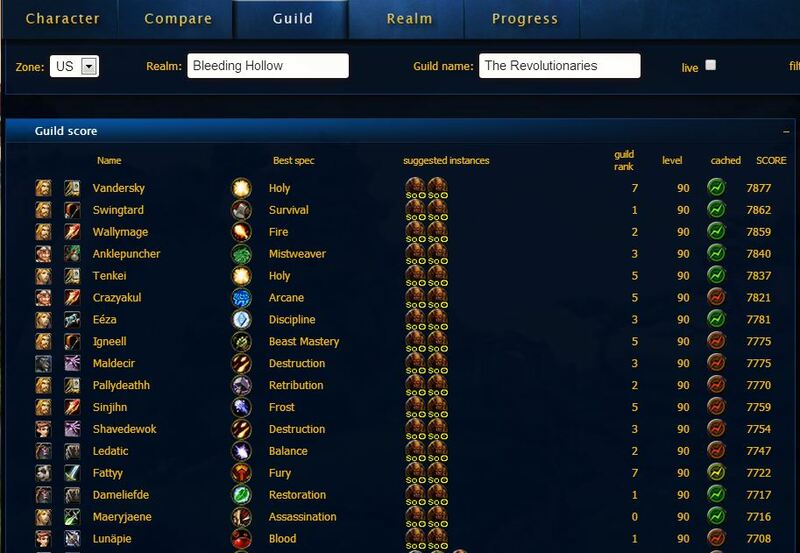 This is all very useful information but most of all, it will include you in the master list of active guild members. To make sure you are listed on the guild master list click on the Guild tab at the top and fill in the details for the zone, realm and guild name then click search. You will notice guild members listed and to the far right, there are red/yellow/green dials. Green indicates that the player updated her/his information within the last few days. The red indicates that the information is too old to be useful and needs to be updated. Be sure that you visit wow-heroes every time you improve your gear set and update your character info by clicking the "live" box. Then visit the guild master list to make sure your dial is green! Also, for our guild members who pve and pvp, please make sure you log out in your pve gear so your guild ranking is accurate.